The Quill traveled with some of La Harpe's best April 25-28, to the Talladega Superspeedway NASCAR Race Track in Alabama. The weekend featured the Aaron's 312 and Aaron's 499. The men witnessed two NASCAR Sprint Cup Series practices, qualifying races, and then on Sunday, joined thousands of NASCAR fans to watch Kyle Busch and his No. 18 Sprint car win his seventh NASCAR top three series this year. They witnessed Tony Stewart as he led the first 20 laps, breaking a record of the most number of consecutive laps a leader was able to stay out front. Only five times in the 188-lap race was a driver able to hold the lead for more than 10 consecutive laps, and Stewart did it three times for a race high of 61 laps in the lead. They also witnessed two big crashes in the final 13 laps that took out 17 cars. Tony Stewart and Dale Earnhardt Jr. led a combined 107 of the 188 laps, but the two got together on Lap 173 ending any hopes for a victory. Busch said he didn't remember ever finishing at Talladega without wrecking. When you go on a trip, take "The Quill" along and capture your picture with it,and send it to us. Let's see where all "The Quill" can go. 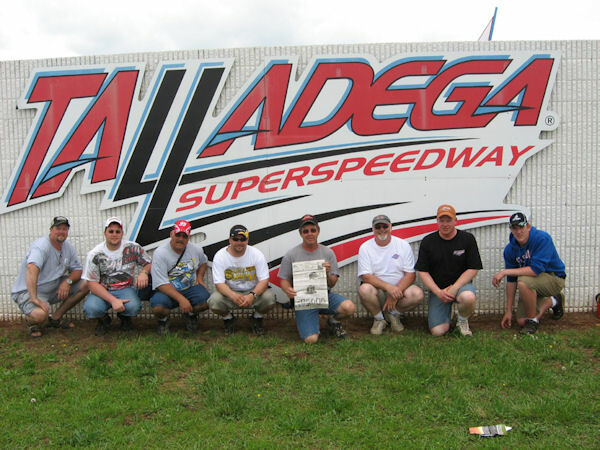 At Talladega, Superspeedway in Alabama: from left: Kerry Renfro, JD Hobby, Dave Hobby, Brian Brown, Ken Brown with "The Quill", Billy Bob Lionberger, Mike Lionberger, and Nathan Lionberger.